Dept. Of Engineering / Engineering / EC-Electronics & Communication Engg. Electronics and communication Engineering (ECE) department started functioning in the year 2003, the foundation year of the RIRT. Since its inception, the department has maintained highest standards in providing quality education in the field of Electronics and communication. The department runs both undergraduate and postgraduate programs. The department is not only equipped with excellent infrastructure and state of art equipments to explore the technological advancement in the relevant field; its labs are also furnished with advanced hardware and software tools. Department has more than 45 faculty members, most of them with Masters and few with Ph.D. degrees. Some of the faculty has vast industrial/Research experience in National Institutes of repute such as Tata Institute of Fundamental Research (TIFR) and Indian institute of Technology, Kanpur respectively. Department has 10 different laboratories in the undergraduate discipline such as Microwaves, TV & Radar, Fiber optics, Advanced Communication etc. 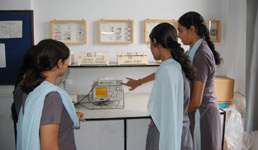 These laboratories are well equipped in the state of art equipments, meeting all the requirements of the RGPV; the technical university of the state and also additional equipments to impart beyond the syllabus knowledge. All the seats in the department are always filled up by academically good students, who are further groomed for the overall development apart from theoretical and laboratory skills. Department is much concerned about complete and thorough coverage of syllabus and also the topics beyond the syllabus. 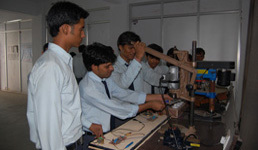 Most of the student projects are hardware based which have industrial and social relevance. Our teaching learning methodology includes student’s seminars and group discussions, guest lectures, industrial interactions, tutorial and assignments and total personality development.